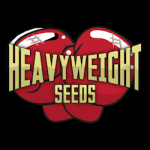 Heavyweight Seeds - Budzilla. Free US delivery. At last, the moment has emerged! A devastating blend of the legendary G13 with Heavyweight's ultimate Skunk#14, Budzilla is essential for almost any serious grower. For earth shattering, soaring highs and jaw dropping yields, Budzilla just cannot be beaten. Even though Sativa dominant, this plant is pretty short, with extraordinary dense bud formations - lots of air-flow is crucial to diminish the chance of mould forming on the monster colas. The flavour is characteristicallly hazey, and the outcome is quite uplifting - initially extreme, and also over time the intensity just has a tendency to increase!